Welcome to an atmosphere of elegance, adventure, serenity and professionalism. Elgiboh Travel Agency meets you at the right point with the right solutions to all your business or leisure concerns. We value your time, business and are dedicated to offer you the best that life can give. 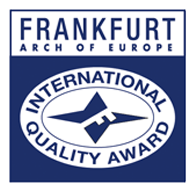 On the 1st of July 2017 in Frankfurt, Elgiboh Travel Agency & Tours was presented with a special regognition award - Arch of Europe for Quality and Technology in the Gold Category.